Will Apple Raise Its Dividend in 2017? Could tax reform turn into a big payday for shareholders of the tech giant? Find out what dividend investors should expect this year. The success of Apple (NASDAQ:AAPL) has made many investors rich, and throughout most of the tech giant's history, dividends played a tiny role. Recently, though, Apple has embraced dividends, and now, some income-hungry investors look to the iPhone maker for its quarterly payouts as well as its potential for stock-price increases. With tax reform proposals that could unlock some of Apple's overseas cash stash, Apple might be in a better position than ever to consider a dividend boost this year. Let's look more closely to see if Apple is likely to raise its dividend in 2017. Like many tech stocks, Apple was slow to jump on the dividend bandwagon. The company paid a small dividend during the late 1980s and early 1990s, but it stopped making those payments in 1995 and left shareholders with a 17-year period during which they received nothing in dividends from Apple. In 2012, Apple restored its dividend, setting a quarterly payout of about $0.38 per share when you adjust for the 7-for-1 split the tech company made in 2014. That worked out to a yield of a bit less than 2% and a payout ratio of about 30% of Apple's earnings at the time, which was in line with what many other technology companies had done with their dividend policies. 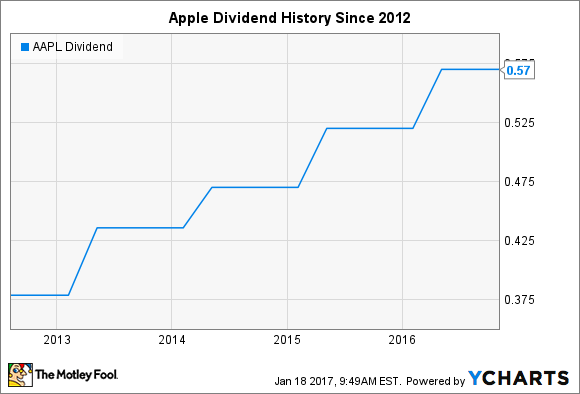 Since then, Apple has rewarded dividend investors with payout boosts every year. Increases of 15% and 8% came in 2013 and 2014 respectively, and subsequent increases have been roughly 10% each year. Along the way, Apple has become one of the biggest payers of dividends in the stock market, routinely sending more than $10 billion in capital back to shareholders every year through its quarterly payouts. Yet not everyone was happy about Apple's emergence as a dividend giant. Even when the dividend first began in 2012, some saw the move as a sign that Apple's days as a growth stock had come to an end. Fears arose that Apple would begin to resemble worse-performing mature tech stocks, despite the success of its budding lines of mobile devices. If nothing else, the fact that Apple has achieved the largest market capitalization of any stock in the market has reduced its future growth potential to some extent. Yet the iPhone maker has continued to increase its free cash flow, securing funding necessary for its double-digit percentage dividend increases each year. Some criticize Apple's failure to deliver revolutionary innovations in recent years, but the company has effectively taken advantage of still-strong demand for its mobile products and has sustained customer loyalty with incremental evolutionary changes to the devices over time. Indeed, even with its dividend hikes over the years, Apple's payout ratio has fallen slightly, now resting in the mid- to upper-20s as a percentage of earnings. If Apple were to decide that its growth potential had in fact slowed, it would be natural to pay a higher proportion of income to shareholders as dividends, and that could bring a big jump in yield to the stock. Finally, the potential for tax reform could prompt a different approach to dividend policy. Currently, Apple keeps considerable amounts of cash overseas in order to avoid repatriation taxes. With the incoming Trump administration considering tax cuts to encourage businesses like Apple to bring capital back to the U.S., the Cupertino-based tech giant might take advantage of such provisions and boost the amount it returns to shareholders. For now, Apple remains squarely in growth mode, and so a typical 10% increase would bring the quarterly dividend up to $0.63 per share. At current prices, that would push the yield slightly above the 2% mark, keeping pace with recent stock-price gains. The tech giant has made a habit of announcing its annual dividend increases in late April, and there's no reason to expect a departure from that practice in 2017. The only serious question is whether any future change in tax policy could prompt a response from Apple in accelerating its dividend growth going forward.